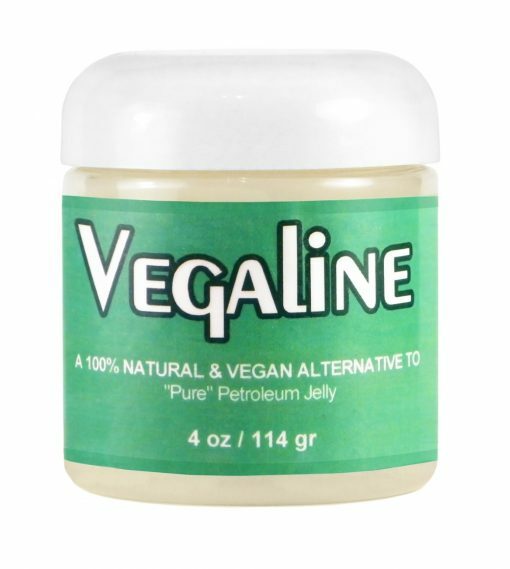 Vegaline, a 100% as well as vegan alternative to “Pure” Petroleum Jelly, is made with simple, natural and certified organic ingredients – super nourishing and quick absorbing oil and waxes. Vegaline will help your skin stay soft all day long. Leaving your skin looking soft and moisturized, Vegaline can be used for: moisturizing the face, keeping lips soft, styling and nourishing dry and brittle hair, keeping your body moisturized, tattoo aftercare, removing makeup, priming your face, helping cracked and dry heels and feet, soothing delicate baby bottoms and everything else “Pure” Petroleum Jelly is used for! Vegaline is great for: sunburns, dry skin, blemishes & acne, rashes, sensitive skin, cracked lips, cracked heals, eczema, and irritated skin. Vegaline is unscented and hypoallergenic. mineral oil, petroleum jelly, fragrances, parabens, phthalates, phenoxyethanol, alchohols and any other synthetic ingredients. 4 oz /114 g – 8 oz / 228 g.
*Safflower Oil, Soy Wax & Candelilla Wax. ( * = Certified Organic) *Safflower Oil, Soy Wax & Candelilla Wax.